CT-ART is based on training material developed by Maxim Blokh, an experienced coach and ICCF grandmaster. It is geared towards players who have already mastered basic tactics. If you need help with basic tactics, I would first recommend Chess Tactics for Beginners. CT-ART is popular among chess schools and trainers because the program can keep a separate profile of the performance and test results of each student. It provides a system of training that can take you from an intermediate player to an international master. This has actually been demonstrated by WGM Irina Mikhailova, who was a pioneer in implementing software-based training courses at the Petrosian Chess Club in Moscow, where CT-ART is used for tactical training. She has described her training methods in a couple of very interesting articles that are available online. As far as I know, this is the only publicly available description of a comprehensive chess course based on training software. CT-ART allows you to select and view the training material based on difficulty, motif (undefended piece, weak back rank, etc. ), tactical method (removal of the guard, deflection, decoy, etc. ), exercise number, the side you are playing and so on. You can take advantage of these possibilities by adjusting the selection of exercises to those areas that need the most improvement. A motif is a particular characteristic of the position that creates the opportunity for a tactic or a combination. Here, the motif is Black’s weakness on the back rank, and the tactical method is the means to exploit it. In our example, the black rook on a8 guards the eighth rank and prevents White from invading. Therefore, the standard tactic “removal of the guard” comes to mind. Finally, you must possess the technique to calculate a forced variation to implement the tactic. In the diagram, White has a forced mate in four moves, starting with 1.Qxa8+! Most players will use CT-ART to solve challenging exercises that teach them something new, but you can also use it for tactical speed training by choosing exercises that are relatively easy. Plus, studying and solving tactical exercises will enhance your ability to calculate variations. WGM Mikhailova provides her students with the helpful guideline to first look at checks, captures and threats before moving on to less forcing moves. Obviously, her advice would have worked quite nicely in the example above! CT-ART offers over 1,200 exercises, with more than 1,000 supplementary examples. The exercises vary widely in difficulty, with the easiest suitable for those rated around 1500, and the hardest able to pose a challenge to an international master. It is important that you objectively estimate your own strength, so that you begin at an appropriate level. This will increase the likelihood that your training will be successful and that it will become a regular activity – just as it needs to be. One way to determine where to begin is by selecting “Grades by difficulty” inside the course navigator (see below). Then, when you find that you are answering some of the exercises incorrectly, you can use the “Browse” button on the toolbar to see what rating level is assigned to those exercises. This will give you an indication of your rating within the context of CT-ART, and consequently you can use this rating to set the parameters when selecting exercises for your tests. The course navigator is the control center for CT-ART. It is displayed when you launch the program, but it can also be accessed from the toolbar. The image below shows the toolbar buttons that allow you to select and browse the exercises, practice, take a test or examine alternatives with the help of a built-in chess engine. Clicking on “Navigator” opens the course navigator (shown below), which allows you to categorize the training exercises by tactical method, combinational motif or grades of difficulty. As you can see “Combinational motifs” has been selected and the further classification is very detailed. The “User” drop-down box, at the top right of the screen, allows you to select a user, and below that the “List of users” button presents a dialog box that allows you to select, create, remove or rename users. This feature is most useful to trainers who use CT-ART to keep track of multiple students. The “Test” and “Practice” buttons at the bottom of the dialog box correspond to the same buttons on the toolbar. The only difference is that the course navigator allows you to select the categorization and gives a detailed overview of the exercises. At the top you are shown your results for today, then a description of the theme or section you chose, and below that your overall results for this theme. At the bottom there is a text box displaying the number of the first exercise in the section you selected. You can either leave it as is or type in a different number. This will be the first exercise for the practice session. When you have solved an exercise, you can start the next one by clicking on the blue arrow below the diagram or by using the F4 function key. You will also be alerted as you finish one section and the next one is introduced. In the next article, I will look at test mode as well as some of the other features of CT-ART that illustrate the advantages of software-based training. I will also demonstrate how to track your progress and illustrate how the activity and performance statistics offered by CT-ART are of interest to both individual players and trainers. In last month’s I discussed the overall structure of CT-ART, some basic concepts and introduced practice mode. This month I will look at test mode and how CT-ART can answer questions about moves and variations that are not dealt with in the solutions to the exercises. I also cover a nice feature of CT-ART which effectively multiplies the number of available exercises. Finally I describe some of the statistics that CT-ART offers to keep track of activity and performance. Test Mode can be accessed through the course navigator or the “Test” button on the toolbar (as described in last month’s article). In both cases, the “Test parameters” dialog box is displayed (see below). On the left side of the screen, there is a list of themes from which you choose a test category. The contents of the list depends on the criteria selected in the course navigator (Tactical methods, Combinational motifs or Grades of difficulty). On the right side of the screen, several parameters are offered to filter the exercises. 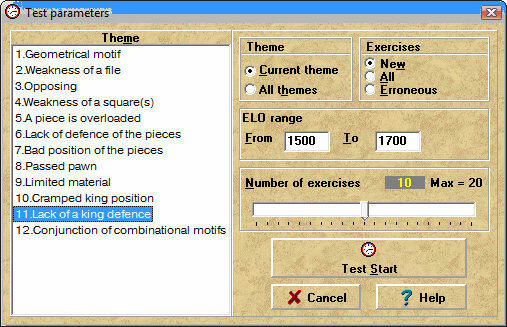 “Current theme” limits the test to exercises from the selected theme and “All themes” utilizes all available exercises. Exercises can be restricted to those that have not appeared in previous tests (“New”), or to those that you have previously failed (“Erroneous”), you can also allow any exercise to be included (“All”). The “Elo range” filter allows you to select exercises appropriate for your level of ability (see “Start at the Right Level” in part one). 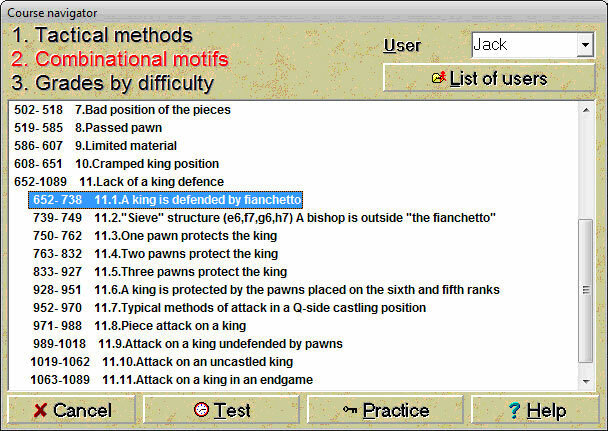 In the image above, “New” exercises has been chosen from the “Current theme,” 11.Lack of a king defense, with a difficulty range of 1500-1700. The “Number of exercises” slider is used to determine how many exercises will be on that test. The maximum number available within the specified criteria is 20, and I have selected 10 in the test. To begin the test, click the “Test Start” button, and the first exercise will be presented. The test will consist of 10 random exercises presented in indiscriminate order. This is a key difference from Practice Mode, where the exercises are always presented in the same order. When solving an exercise, you study the position and then play the move that you consider strongest. If you find the correct move, the program responds with the strongest move for the opponent or will test you on several different responses and variations. If you don’t play the best move, the program will help put you on the right track by highlighting the key aspects of the position, as shown in the diagram to the left. The white triangle in the upper left corner of the image tells us that it is White’s move. The squares highlighted in green (f8 and g8) represent the focus of White’s attack. The pieces involved in the attack are highlighted in red. The arrow from f1 to f8 suggests that this is the file along which White should play, and the arrow from a8 to h8 suggests the general target of the attack. You can turn this feature off by clicking “Options” on the toolbar and clearing “Prompts after errors” on the “Preferences” tab. If you still can’t solve the exercise, you will be shown a simplified example that illustrates the main idea of the original one. This is shown on a 5×5 board adjacent to the exercise. The position on the 5×5 diagram is very similar to the original position and the piece configuration is almost the same. Solving this supplementary exercise is practically equivalent to finding the final moves of the original exercise. If you spot the key idea (and understand the solution!) you are well on your way to solving the original exercise. This is an example of how CT-ART tries to lead you to the correct solution without actually giving you the answer. If you still can’t find the right move, the program will make the first move for both sides and then resume the exercise from there. After you solve the exercise, you are given a chance to review the solution by playing through all the variations, thereby reinforcing what you have learned. Even though CT-ART takes you through all the critical variations during the test, you may be shown some additional variations that did not arise when you solved the exercise. The solution to our exercise is shown above. The main variation is in black and the position is from the game Reti – Bogoljubow, New York 1924. Several side variations are shown and at the end of the solution there is a final variation illustrating why Black resigned after 3.Be8. When practicing, it can be instructive to study all the variations to learn as much as possible from each exercise. Interactive studying is like having your own (infinitely patient!) personal trainer giving you guidance and encouragement, and making the training experience that much more effective and enjoyable. Plus, you are always getting immediate feedback, whether you find the correct solution or not. Anyone who has spent time studying with chess books knows what it is like when you encounter a move that doesn’t look quite right or that the author has not discussed. It can be frustrating to continue without having your questions answered, and perhaps an important learning opportunity will have been missed. 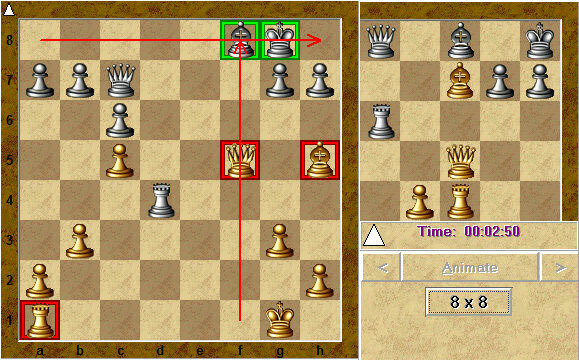 Well, with CT-ART you can use the built-in chess playing engine to test any ideas and answer any questions that are not dealt with directly. Playing the position against the chess engine also reinforces your understanding of the position. Simply right-click on the chessboard and select “Play current position” from the context menu; or select “Play” from the toolbar to play out the current position or any position of your choice. You make the first move and then the chess engine replies. You can also set the amount of reflection time for the engine. The drop-down list at the lower right of the image allows you to choose from many different time controls, ranging from blitz to tournament standard. Here the speed of play has been set to 40 moves in 150 minutes (40/150 min) and Crafty has been pondering the position for 1 second (00:00:01). If you want to analyze the position on your own, without the assistance of the chess engine, select “Self analysis”. 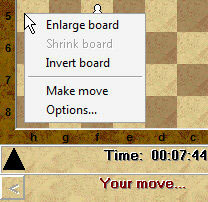 If you want to switch sides at any time, just right-click on the chessboard and select “Make move” from the context menu. If you want to flip the board to look at it from either perspective, just select “Invert board” from the context menu. The point of tactical training is to become familiar with the reoccurring patterns, but you don’t want to be able to solve an exercise without thinking. Just memorizing particular positions without fully understanding them isn’t going to help you in your games. Well, CT-ART has a number of options to display the exercises differently. To the right of the toolbar there are four check boxes that can be used to change the way an exercise is displayed. The Move column controls which side is on move and the Side column controls which side of the board the main events unfold. 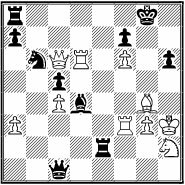 For instance, if you select the upper check box in each column, White will always move first and play will take place on the kingside. 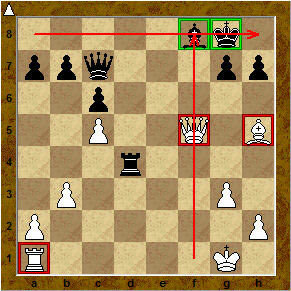 If you select queen, instead of king, the program will mirror the position so that events take place on the queenside. Selecting both king and queen will lead to a random choice for each exercise. Selecting all four boxes effectively increases the number of training positions, since some of them look very different when these settings are used. This method is used by WGM Irina Mikhailova in her training classes at the Petrosian Chess Club in Moscow, as it forces students to rethink the solutions and seeing similar patterns within a different context is akin to playing a real game. As you progress with CT-ART and complete more tests, the program evaluates your rating changes based on your performance. You must realize that it is the rating changes that matters most. This feature is helpful to trainers, who can use it to compare the performance of their students. Each column on the bar graph below corresponds to one exercise. The color and the pattern of the column indicate whether your rating increased, decreased or stayed the same. 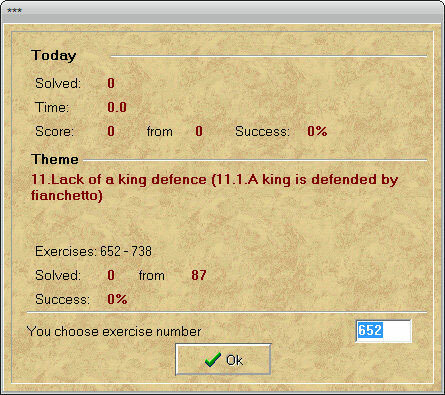 If you correctly solve an exercise, without any clues from the program, then your rating will increase. If you fail to solve it, your rating will decrease. If you need help from the program to solve an exercise, you will get a penalty point. In this case your rating change depends on the number of penalty points. Moving the mouse over one of the columns will show you the details for that exercise. The image above details the information on exercise 635. 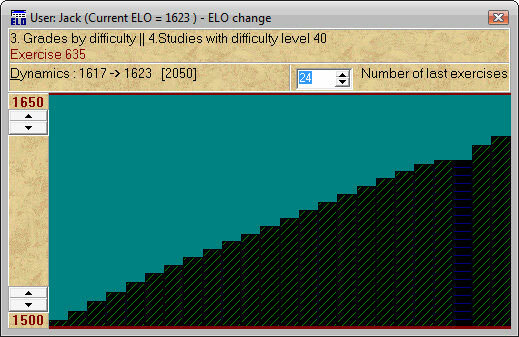 As shown in the upper left of the screen it was solved correctly and the rating increase for solving it was 6 points (1617 to 1623). By the way, although the authors had the FIDE rating scale in mind, don’t expect the rating to be directly comparable to other rating systems. You could, however, compare your rating to others who are also using CT-ART. In addition to the Elo chart, CT-ART collects information about the performance of each student during Practice Mode and provides detailed information about the last ten tests. This information can be extremely helpful to trainers, who will be able to examine the statistics and look for any patterns in the exercises that caused the student problems. I have discussed some important features of CT-ART, but this was by no means an exhaustive explanation of the program’s capabilities. Hopefully, these articles will help players make better use of the program to improve their tactical ability. I’m sure that those who take the time to learn how to use CT-ART and practice regularly will discover the truth of Max Euwe’s words when he wrote, “the development of tactical capabilities is for the greater part a matter of practice and a question of routine”.